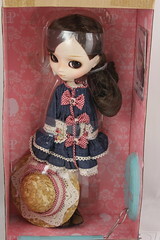 Meg has a MSRP of 16000 yen which honestly still seems a little high to me as that was what the more expensive collaboration releases had been priced at until pretty recently, luckily Pullipstyle has her at a much more reasonable $120. When promotional photos of Meg first surfaced, I honestly liked her because she was at the very least unique and her freckles are so adorable but I was distracted by her garish jacket and her relatively high MSRP. 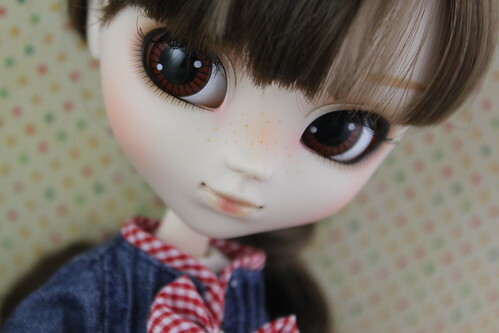 I recently ordered her from Pullipstyle and I was not prepared for how gorgeous this doll is in person. 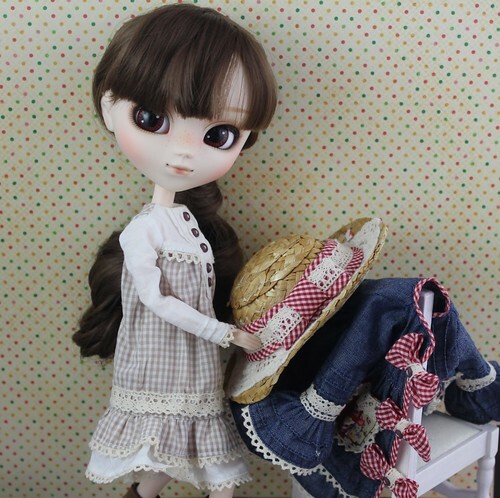 Meg comes with a coat, a dress, bloomers, boots and a straw hat as well as the standard card and stand. 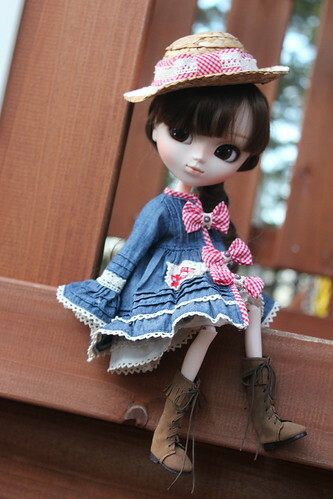 The quality of her stock is pretty nice, it’s cute and well-made. 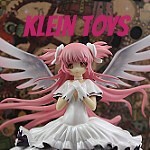 Her wig is a nice color, normally curls kind of intimidate me a bit as I am always terrified I will ruin them and not be able to fix them but hers are nice and the wig is very soft and easy to manage. 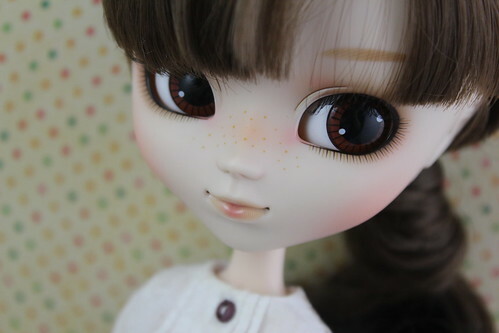 Freckles are pretty rare on Groove dolls so I never really thought I would see a really blushy, freckled Pullip from them though the style is very popular with customizers (bjd/blythe/pullip) right now. 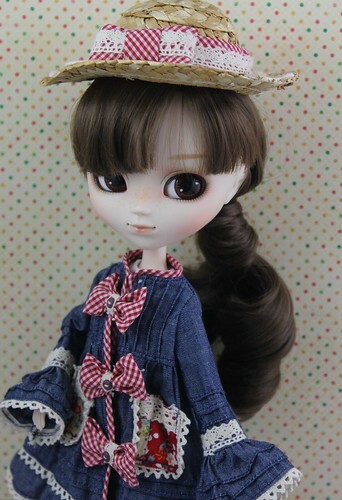 These are probably the most realistic freckles that Groove has ever done on a doll, granted I can only think of three other dolls with freckles they have released over the years: Chenille du Jardin, Anne of Green Gables and Regeneration: Anne of Green Gables. 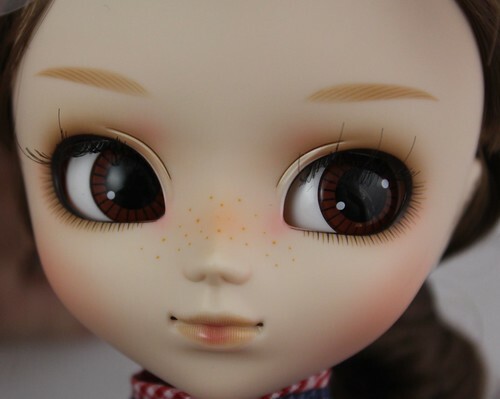 I utterly adore the freckles, I love that she is a very blushy girl and I love all the brown tones it’s a very natural look that suits her wonderfully. It really seems like they put a lot of effort into making her face up unique and it really shows. I love her eye make up, I wasn’t so sure on the lips until I saw her in person but they are very neutral and they are perfect for her. I’m generally not a big fan of the brown toned face ups but her’s is so well done and natural looking, I can’t help loving it. Meg has such a quaint country girl type of charm to her, I almost think she may be traveling with me to Michigan later in the month to go visit the in-law’s farm. As much as I intensely hated the coat in promotional photos, I have to say it’s actually pretty darn cute in person ^^; . 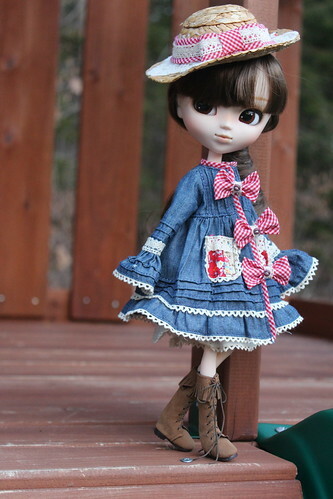 It is well-made and the structure of the coat is actually really nice as much as I’m not a fan of the jean coat the colors all nicely balance. When Groove announced Meg, there was a line about how her mom had hand-made her coat and it definitely exudes a home-made, crafty type of charm. It occurred to me that maybe this is one of those things that looks adorable on a little girl but would be a fashion crime for anyone else. If you had told me when she was announced that I would find myself not hating the coat anymore, I don’t think I would have believed you. 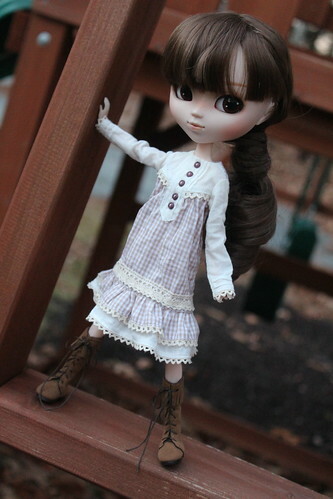 Let’s see what Meg is hiding underneath that coat… why, it’s a lovely brown gingham dress with some touches of lace. 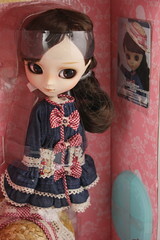 It’s a really cute dress, something loose you could do chores in but the lace gives it just a touch of femininity. This is my favorite of all the pictures I took of Meg. I wanted to get a picture of her that showcased her boots a little bit, I didn’t expect it to turn out quite this cute or for the photo to become that popular. When Meg was announced I joked about if the higher MSRP was because of the coat Groove could keep it in exchange for a lower MSRP, I never gave her boots much of a thought then but if there was a higher production cost related to Meg it was definitely those boots. 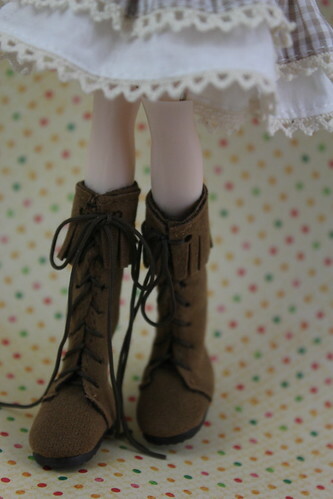 Not only are they adorable they are extremely well-made and they complement her outfit beautifully. They are so cute, they required a close up! Those big brown eyes and those freckles just get me every time! She is gorgeous. 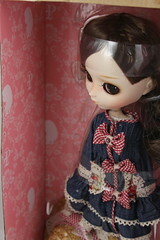 Even more photos of Pullip Meg are available on my flickr. 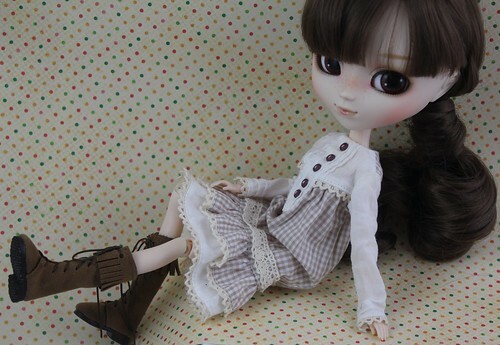 She is available for purchase via Pullipstyle. For anyone curious about such things, I named her Vera-Ellen which is kind of an obscure movie reference (hint: it’s the real name of a Devil’s Reject). Meg isn’t the sort of girl who would even watch such a film but I had wanted a doubled first-name for her and was having a hard time thinking of one. I had a vague recollection that Baby’s real name was a doubled first name so I looked it up, discovered it was Vera-Ellen and somehow I just knew the name was perfect for her. 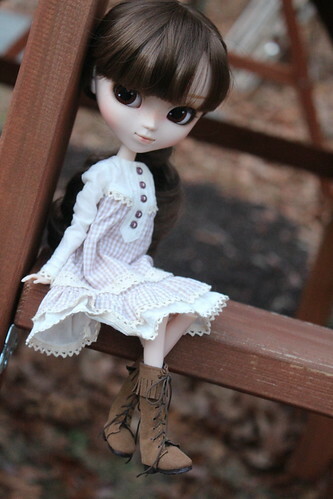 This entry was posted in Doll, Pullip and tagged meg, Pullip, pullipstyle. Bookmark the permalink.